Looking for sold, year-end 2018 single family home market data for the Tahoe Donner area? Here is the year-end 2018 review for the Tahoe Donner Community in Truckee. 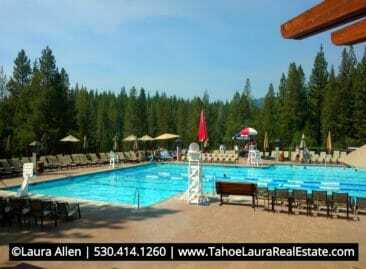 The Tahoe Donner real estate market conditions continue to be strong, and favor Sellers. The average median home sale price for 2018 in Tahoe Donner was $719,000 which was a new high for this resort community. Inventory levels of available homes for sale in Tahoe Donner remain critically low and limited with Buyers having very few buying options most price points. On January 13, 2019 there were only 36 home for sale. trend for the average median home sold sales price move up and 2018 just edged out 2006. 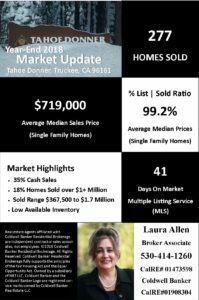 In 2018, Sellers realized 99.2% of the their listed price to the sold average median sales price in the greater Tahoe Donner area (MLS Areas 9TD). This is close to the over-all region, which was just slightly higher at 99.5%. ggressive on their offered price are going to have a hard time in this market. Other interesting Tahoe Donner single family home market observations: Days on Market (DOM) dropped a few days from 2017 to 2018. For 2018 is the number of days on the market for single family homes is now at 41 days, which is down 4 days from 2017, but is down 32% from the 60 DOM in 2016.
region and increased +6.4%, which is below the North Lake Tahoe – Truckee regional single family home price increase of +7.45% for 2018, but is almost the same on the median average sales price. 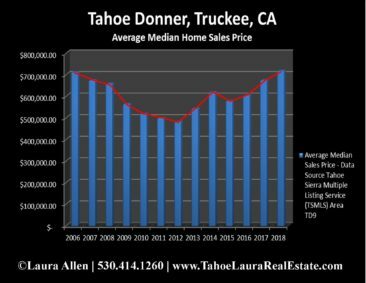 Only $1,000 separates the two median average sales price of $719,000 for Tahoe Donner (TSMLS 9TD) and the North Lake Tahoe – Truckee Region of $721,000 (TSMLS Areas 1-9). Short Sales = Owner does not have the money to pay off all of the debt and asks the debt holders to take less back in order to close the sale. *YTD period is 01/01/2018 – 12-31-2018. Data maintained by the TSMLS’s may not reflect all real estate activity in the market. All information is deemed to be reliable, but is subject to change, modification, and/or correction without prior notice.